Sugar snap peas, alongside with snow peas, are a different species of peas wherein the whole pods are eaten. Binomially, they belong to the Fabaceae family of legumes; grown as both garden vegetables as well as field crops. As in green or shelling green-peas, sugar peas also are one of the ancient cultivated plants growing all over the temperate and colder climates. Scientific name: Pisum sativum var. macrocarpon. Both sugar snap and snow pea pods are famous as mange tout (which mean, "eat all" in French) in many regions of Europe. Sugar snap pea in a pea plant. Note for the bright green pod. Unlike shelling peas which are Asian by origin, sugar snap peas thought to have originated in the Europe. The plant is a rapidly growing, bushy annual vine, which may require support, especially in some climbing varieties. Small white/cream color flowers appear after a few weeks of the seedling. The pods are full, cylindrical with thick edible skin and round, green seeds inside, as in shelling peas (in shelling peas, however, the skin is inedible). This feature is in contrast with snow peas, where the pods are flat and inside seeds are actually tiny ovules. Pea tendrils are tender top shoots of young pea plants, had similar pea flavor and used in cooking as well in salads. Snap peas feature comparatively fewer calories than that of green shelling peas. 100 g pods provide just 42 calories against 81 calories of green peas. However, the snap pods indeed hold more vitamins, minerals and other plant nutrients than the traditional shelling peas. Since sugar peas consumed as a whole, they provide relatively higher dietary fiber. Fiber diet helps reduce blood cholesterol levels, obesity, and constipation. Fresh pods carry 150% more amounts of vitamin-C than in garden peas. 60 mg, or 100% of daily required levels of vitamin-C. It is a powerful natural water-soluble antioxidant. Vegetables rich in this vitamin help the body develop resistance against infectious agents and scavenge harmful, pro-inflammatory free radicals from the body. Fresh sugar pea pods are an excellent source of folic acid. 100 grams of fresh peas provides 42 µg or 10.5% of recommended daily levels of folates. Folates are one of the B-complex groups of vitamins, required for cellular DNA synthesis. Research studies suggest that adequate folate-rich foods in expectant mothers would help prevent neural tube defects in the newborn babies. Like in shelling peas, sugar snap pods are also rich in phytosterols, especially ß-sitosterol. Studies suggest that vegetables rich in plant sterols like legumes, fruits, and cereals help lower cholesterol levels in the body. Sugar pea pods have more vitamin-K than that in shelled peas. 100 g of fresh leaves contain about 25 µg of the daily requirement of vitamin K-1 (phylloquinone). Vitamin-K has been found to have a potential role in bone mass building function by promoting osteoblastic activity in the bone. It has also an established role in Alzheimer's disease patients by limiting neuronal damage in their brain. Fresh green peas also contain adequate amounts of antioxidants flavonoids such as carotenes, lutein, and zeaxanthin as well as vitamin-A (provide 1087 IU or 37% of RDA per 100 g). Vitamin A is an essential nutrient, which is required for maintaining healthy mucus membranes, skin and is also critical for healthy eyesight. Consumption of natural foods rich in flavonoids helps to protect from lung and oral cavity cancers. In addition to folates, snap peas are also good in many other essential B-complex vitamins such as pantothenic acid, niacin, thiamin, and pyridoxine. Furthermore, they are a rich source of many minerals such as calcium, iron, copper, zinc, selenium, and manganese. Fresh pods are eaten as a whole. They are sweeter and nutritious, so, use them as soon as their harvest/purchase. Sugar peas in a vegetable market. In the markets, choose fresh, tender bright-green pods, which give an audible “snap” as in snap beans when broken. Buy full, uniformly sized pods featuring smooth skin. Avoid over-mature pods as they bit out of flavor. Similarly, avoid those with cuts, cracks, mold, and discoloration. Once at home, store them in a plastic cover and place inside the vegetable compartment of a refrigerator set at high relative humidity so that they remain tender and crispy for about 2-3 days. Fresh pods are eaten as a whole. Use them early while pods are fresh and crispy. The pods have a string at suture lines that needs to be removed before eating them raw or in cooking. To prepare, wash in cold water, and pat dry. Trim the stem end and remove the stringy fiber on either side of the pods. Green peas sauteed with oil, garlic, and onion. Photo courtesy: Robert Couse-Baker. Raw sugar snap peas are a great addition to vegetable salads along with carrots, celery stalks, peppers, beets, etc. Prolonged cooking at high temperatures makes them lose flavor. Cook the whole pod just for a few minutes in boiling water, and serve with cream vinaigrette as an appetizer. Duck roast with blueberry sauce, side of snap peas. Photo courtesy: naotakem. Gently, stir-fry separately before mixing them with other vegetable stir-fries like beans, potato, sweet pepper, etc. Sautéed snap pea pods served with chicken, duck, and seafood like salmon, shrimp, etc. Snap peas contain small amounts of 50 mg/100 of oxalic acid; a naturally-occurring substance found in some vegetables, which, may crystallize as oxalate stones in the urinary tract in some people. On coparison note: 100 g of spinach carries 970 mg. All types of peas, including snap and snow peas can be safely eaten in all individuals without the fear of kidney stone disease. Adequate intake of water is, therefore, encouraged to maintain normal urine output to minimize the stone risk. (Medical disclaimer). <<-Read Green peas nutrition facts and health benefits. 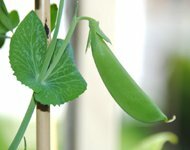 <<-Read Snow peas nutrition facts and health benefits. <<-Back to Vegetables from Snap Peas nutrotion. Visit here for an impressive list of vegetables with complete illustrations of their nutrition facts and health benefits. Refer Stanford School of Medicine Cancer information Page- Nutrition to Reduce Cancer Risk (Link opens in new window). Sugar snap peas. (Link opens in new window). Oxalate content of selected vegetables (Link opens in a new window).